Whether you love to work out, hate exercise, or are somewhere in between, you can follow this plan. That’s because you start at your current level (even if you’re sedentary) and gradually increase minutes and intensity. I co-designed it with Michelle Kennedy, M.S., a San Francisco-based exercise scientist, certified personal trainer, and former National Institutes of Health researcher. I’ve seen Michelle in action—she challenges you to ramp up your exercise up a notch, while keeping it safe and fun. If you’re serious about losing weight and keeping it off, exercise is a must. Need some inspiration to lace up those sneakers? 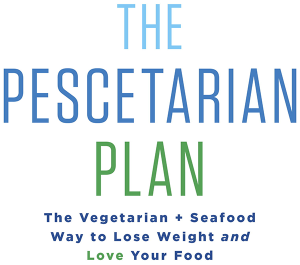 Go back to Chapter 9 of The Pescetarian Plan to remind yourself of all of exercise’s fabulous benefits (including being able to eat more food). Adding Physical Activity to Your Life Here you’ll find sample weekly exercise plans, and links to lots of great exercise info. Videos. I found the “Muscle Strengthening at Home” and “Muscle Strengthening at the Gym” videos particularly helpful because they clearly demo the correct (and safe) ways to lift weights and do other strength-building exercises. Strength Training Exercises for Older Adults. Based on exercises designed at Tuft University for older people, these moves (videos included) not only increase strength, but help improve balance and coordination. Here’s to a fitter you! Whether you’re a Beginner or not, you’ll be adding both minutes and intensity as the weeks go on. Find out what “low”, “moderate”, and “vigorous” intensity means by clicking here. 1 Do what you usually do and log it, recording minutes, type of exercise and distance (i.e. 1 mile). If you strength train, record types of moves, weight, number reps and sets. Walk outside or on a treadmill (or use a stationary bike) at low to moderate intensity. If you can do this more than 3 days this week, all the better! Add five minutes to your current workout. If you want to try interval training, do twice as much low intensity as vigorous. For instance, do 1 minute of low intensity followed by 30 seconds of vigorous intensity, followed by 1 minute of low intensity and so forth. Both Beginners and Everyone Else: Do at least 6 different moves, working both upper and lower body. Three moves should target these large muscle groups: leg (such as the half squat or extension) , back (such as the superman or back extension) , and chest (push-ups or chest press). 2 times a week (and no more than 3 times) do each move 8 times (that’s called a “repetition” or “rep”. Everyone else: At least twice a week, do each move 10 to 12 times (that’s called a “rep”). If you’re already strength training and are doing more, then keep doing what you’re doing. If you’ve never done strength training, follow the Beginners’ instruction. 3 days a week, add 5 minutes to your walk (or stationary bike workout) for a total of at least 20 continuous minutes per session. 4 days a week, walk or pedal on the bike for at least 15 continuous minutes per session. Either way, warm up for five minutes, then, sustain a moderate intensity for the rest of the session. If you can’t do moderate intensity, keep it at low intensity. Plus, on days you don’t do cardio, walk for at least 20 minutes. Everyone else: stick with Week 2 recommendations. Make sure you hit the 30 minutes, 3 days a week minimum. Plus, on the days you don’t do cardio, walk for at least 30 minutes. Same as Week 2 for both beginners and everyone else. 3 days this week, get at least 35 minutes of moderate or vigorous intensity (or interval training). 4 days this week, get at least 26 minutes of moderate or vigorous intensity (or interval training). On the days you don’t do cardio, walk for at least 30 minutes. For a greater challenge increase weight. 3 days a week, at least 25 minutes per session. 4 days this week, at least 20 minutes per session. You can keep the first 5 minutes at low intensity as your warm-up, but try to finish out the rest at moderate. Or, if that’s too tough, then try a mix of low and moderate intensities as described in Week 2. On days you don’t do cardio, walk for at least 25 minutes. Everyone else Stick to Week 4 prescription. Stick with Week 4 recommendations.Beginners and Everyone Else: If your weights feel too easy, switch to heavier weights. 6 Beginners: Stick with Week 5 recommendations.By now, most of your workout should be spent at a moderate intensity—not low intensity (unless your healthcare provider recommends you keep it at low intensity). If you’re not already doing so, do the interval training recommended in Week 1. On days you don’t do cardio, walk for at least 30 minutes. Walk for 30 minutes on the days you don’t do cardio. Everyone else: Stick to Week 6 prescription. Beginners and Everyone else: Stick with Week 4 recommendations but add two more moves for a total of 8 moves—whichever type you like. You can choose moves from this CDC website if you like. 8 Beginners: Stick with Week 7 prescription.If you feel fit enough, try adding vigorous intensity to your interval training. For instance, work out at low intensity for 1 minute, then vigorous intensity for 30 seconds, then back to low intensity for 1 minute, and so forth. Beginners and Everyone else:Stick with Week 7 recommendations. If any of the exercises are starting to feel too easy, make small adjustments such as increasing the weight and/or decreasing the time you rest between sets. This will increase the intensity without having to add more exercises. 9 and beyond “Beginners”: I’m putting this in quotation marks because you’re no longer beginners but serious exercisers!Over the next weeks and months, keep building intensity so that you’re working out at moderate intensity at minimum, all but the first three warm-up minutes of the workout. Even better, do interval training as described in week 8. For best weight loss results, gradually increase your endurance so that you’re exercising 200 to 250 minutes per week at moderate intensity, or 100 to 125 minutes weekly at vigorous intensity. Or, if you do interval training , alternating between low and vigorous, then 150 to 190 minutes weekly should do it. Beginners and Everyone else:Continue to add more weight when exercises get too easy. Ideally, strength train three days a week. And change your moves to keep thing interesting and work out different muscles. If you’re up for it, do 10 moves total.